Posted on Friday, June 15th, 2012 at 11:59 pm. 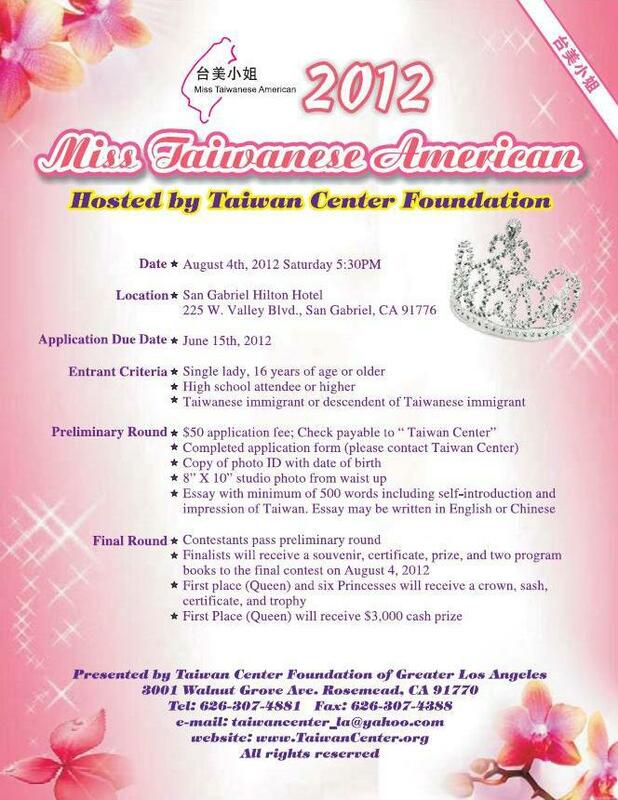 The 2012 Miss Taiwanese American Pageant is now open for application! Be an Ambassador for the Taiwanese American community! The 2012 Miss Taiwanese American Pageant will be held on August 4, 2012. The application deadline is on June 20, 2012. Preliminary (phone or in-person) interviews will be scheduled with you immediately after you submit your application. This is a once-in-a-life time experience! This experience helps with personal growth, maturity and future professional development. If you are interested, please visit this website: http://misstaiwaneseamerican.blogspot.com/. The application and more details on the application process are available on the website as well. If you have any additional questions, please email [email protected] or call (626)307-4881. Taiwan Center Foundation of Greater Los Angeles, a 501(c)3 nonprofit organization, is the producer and owner of the trademark of the Miss Taiwanese American (MSTA) Pageant.